It's a euphorbia. I'm not sure exactly which one as someone gifted it to me out of her garden. Thanks for the question. That helps! I thought those little leaves looked familiar. Thanks, beautiful place! Hi. Thanks for the inquiry. This is moss. It can handle only occasionally light foot traffic. The toughest ground cover I know of is Mazus. You may want to consult a good local garden center to see what will do well under your conditions in your area. Beware of English ivy as it is toxic to dogs if ingested. It's magical. Would this work in VA.
Hi, thanks. This absolutely would work in Virginia. In my opinion, the key to a good looking natural water feature is that you have a natural slope. You can always build up a flat area but it never looks quite as natural. Good luck! Send in some photos if you decide to execute your project. Introduce the element of water. Few things have captured the imagination of the human race like water. Water nourishes and sustains, reflects and absorbs light, and provides a home to a multitude of creatures, all of which are reasons to include some type of water element in almost every garden. 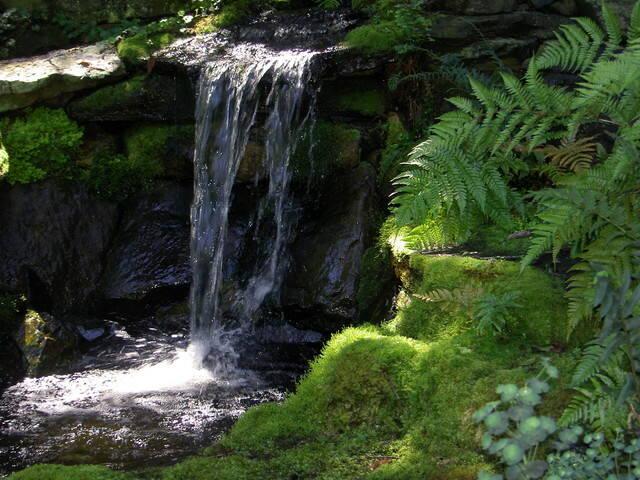 The sound and movement of water bring a special degree of visceral animation to the garden.The specific type of water feature you choose to incorporate into your personal space will vary according to your affinities, space and budget. You may choose a naturalistic type of pond like the one shown here, or even a trickle of water flowing through a piece of bamboo in a Japanese garden. Tip: Consider having your water feature professionally designed, and buy the best equipment you can afford. There is nothing relaxing and nurturing about broken pumps, algae blooms and water leaks. Moss most frequently grows in damp or humid areas. Diverse species can grow in sun or shade, in soil, on rocks and on tree trunks. In summer it can be a plush carpet that anchors our gardens; in winter its luxuriant evergreen color provides that much-needed respite from seasonal doldrums. A traditional waterfall allows for some fine-tuning after installation. By installing a ball valve on the outlet portion of your pump, you can adjust the water flow to provide the sound that pleases you. Never install the valve on the intake portion of your pump, as this can significantly shorten the life expectancy of your equipment. The addition or subtraction of rocks at the base of your waterfall can significantly affect the quality of the sound it produces. Adding rocks will brighten the sound and create splash. For ease of maintenance, be sure that doing this will not cause your feature to lose water. Въведете елемента на водата. Малко неща са завладели въображението на човешката раса като вода. Водата подхранва и поддържа, отразява и поглъща светлината и осигурява дом на множество същества, всички от които са причина за включването на някакъв вид воден елемент в почти всяка градина. Звукът и движението на водата довеждат до градината специална висцерална анимация. Специфичният тип вода, който сте избрали да включите в личното си пространство, ще варира според афинитетите, пространството и бюджета ви. Можете да изберете натуралистичен тип езерце, като това, което е показано тук, или дори струйка вода, която тече през парче бамбук в японска градина. Waterfall aspect would work well in corner of backyard next to the fence making a beautiful focal point.